What has recently maligned the Indian American community is the H1B Visa fraud which has been continuing to deceive tens of thousands of H1B seekers and filling the coffers of the few greedy Indian Americans since before the presidential victory of Donald Trump in 2016. Undoubtedly, H1B visa fraud in the United States is a major reason why President Trump has tightened the noose around H1B visa petitioners through a number of reforms in the process. In the latest case of H1B visa fraud in the US, three Indian-origin consultants have been arrested for submitting fake applications for the most popular US work visa in the non-immigrant category between 2012 and 2015. 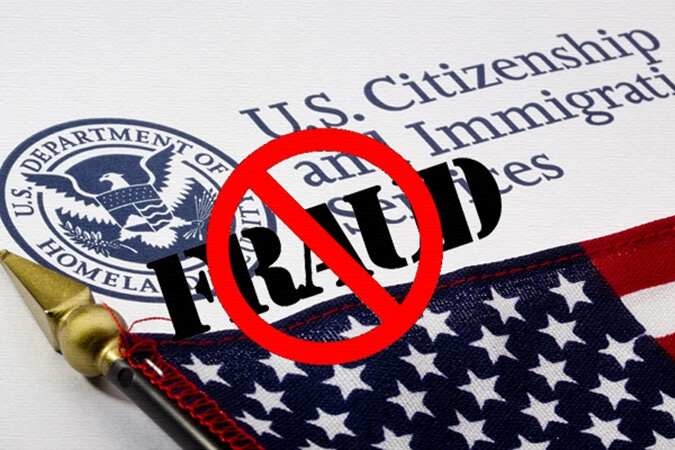 Kishore Dattapuram of Santa Clara, Santosh Giri of San Jose and Kumar Aswapathi of Austin, TX faced indictment on one count of conspiracy to commit visa fraud and 10 counts of substantive visa fraud in the US. They were indicted by a federal grand jury last month, according to a statement issued by the US Department of Justice. The trio, who hail from the south Indian states of Telangana and Andhra Pradesh, have pleaded not guilty of H1B visa fraud, and therefore, they have been released on bail. They are scheduled to appear for the next hearing before a US district judge on May 13, 2019. If they are convicted of the visa fraud in the next hearing, they will be sentenced to imprisonment of maximum 10 years and levied a fine of USD 250,000, along with recompense for any other violation. According to the eight-page indictment, Kishore Dattapuram, Santosh Giri and Kumar Aswapathi indulged in H1B visa fraud through their Santa Clara-based consulting firm, Nanosemantics, which they set up to source foreign workers for IT companies in San Francisco Bay Area, California. An American or US-based employer seeking to hire a foreign worker on H1B visa is required to submit an I-129 petition to the US Citizenship and Immigration Services. The petition contains key details of the worker and the job, including the position and wages. The three Indian Americans – Kishore Dattapuram, Santosh Giri and Kumar Aswapathi – connived with each other to trick the system by submitting sham H1B visa applications for foreign workers in order to gain a competitive edge over their rival consulting firms in the Bay Area. Thus, they managed to obtain H1B visas and made a group of available workers, irrespective of whether the workers were qualified or fit for the available jobs. Surprisingly, most of the jobs mentioned and detailed in the I-129 petitions submitted by them did not exist in reality. In contrast, other Bay Area consultants sourced qualified foreign workers for relevant jobs through a proper channel entailing impeccable paperwork. Moreover, the H1B visa accused trio used to coach foreign workers on how and what to respond to the inquiries by the US government agencies, in order to keep the lid on their visa fraud, according to the indictment. Further, they bribed a local small company for listing it as the employer for foreign workers, who were placed elsewhere though. In the Trump administration, the Department of Homeland Security has busted several H1B visa fraud cases, including two in 2018. 46-year-old Kishore Kumar Kavuru from Andhra Pradesh was arrested on charges of H1B visa fraud in California. He had been the owner and CEO of four consulting companies in the United States since 2007. 49-year-old Pradyumna Kumar Samal from Odisha was arrested at Seattle Tacoma Airport in Washington, on charges of running a multi-year visa-fraud racket. He exploited some 200 foreign workers by taking a partially refundable security deposit of $5000 from each of them for visa filings. Subscribe to Travel Beats’ free newsletter and receive latest visa, immigration, travel news and India community stories right in your email inbox. Travel Beats is a subsidiary of Indian Eagle Travel and a leading community portal for Indians in America. There are many other consultants who are involved in this kind of frauds. Only 3 have been arrested but many are still enjoying the luxury. Sincere people are victim of waiting in long H1B lottery queues. Some of them are waiting for their GC for almost like 15 years. Kudos to Donald Trump and his team for busting this kind of cases.